Hagfish, also known as slime eels, are fascinating creatures. These aquatic animals are known, perhaps most famously, for their ability to exude a mucus that when combined with the surrounding water turns into a truly remarkable amount of slime. This slime is used to attack prey, is used as a defense mechanism against predators, and is generally pretty gross. Now, what does this all have to do with weaving in particular and the fiber arts in general? Well, some scientists are trying to figure out how to turn this slime into lightweight fabric. If you’re wondering exactly how one would look at a pile of slime and think, “Gee, this would make a lovely windbreaker,” you’re not alone. There is, however, a method behind the madness. Hagfish slime is at least partially made up of extra strong and stretchy threads of protein that when dried out feel nice and silky. Even though a single hagfish contains miles of these protein threads, don’t expect them to become the hot, new fiber animal anytime soon. 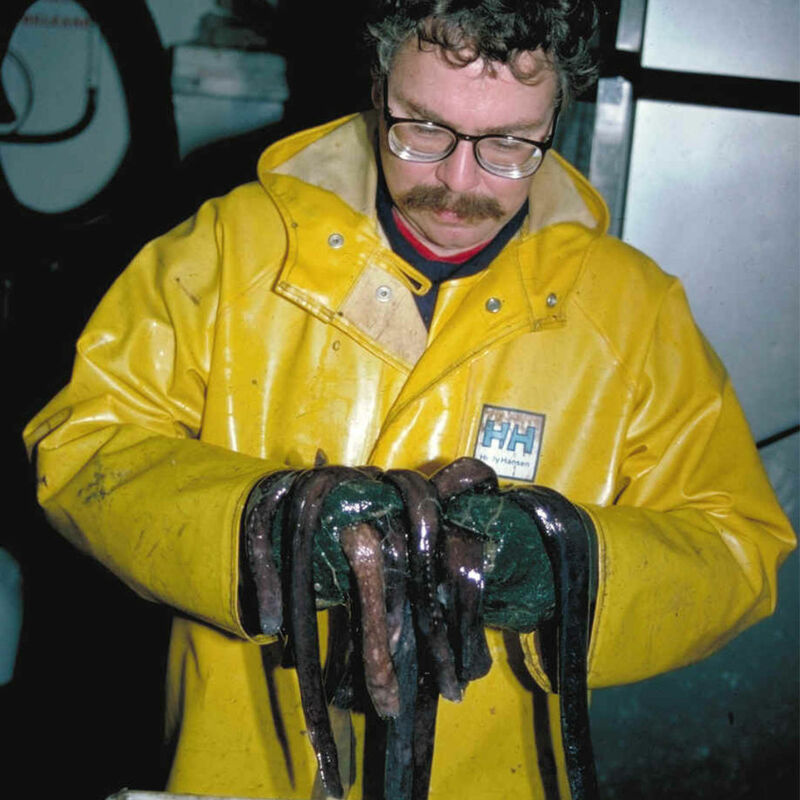 A man holding some black slimefish. Note the thin layer of slime covering his glove. 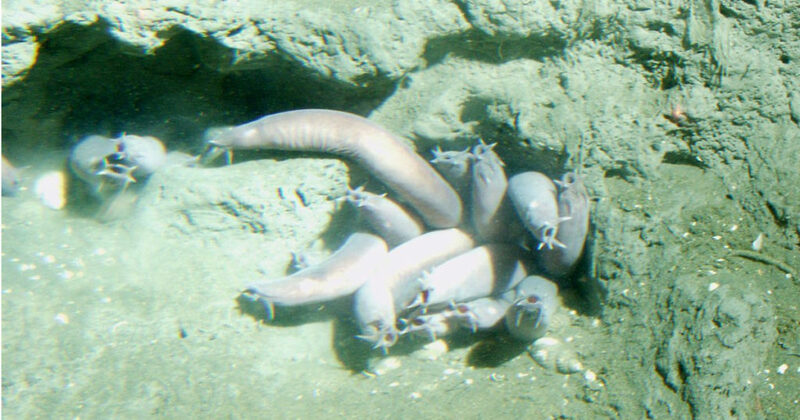 Scientists haven’t quite figured out hagfish reproduction, and since the fish don’t breed in captivity, keeping a school of hagfish to deslime on a regular basis isn’t possible. But that’s not stopping scientists such as Dr. Douglas Fudge, one of the leading voices in hagfish-slime research. Currently, researchers are looking at ways to replicate this thread in a laboratory setting. This is something that has previously been attempted with spider silk—and with minimal successes—but fortunately, the proteins in hagfish slime are smaller than those in spider silk and might be easier to replicate. In the meantime, I think I’ll stick to normal silk. If you want to learn more about hagfish slime and its potential as the new “it” fiber, I highly recommend checking out the website for Dr. Fudge’s lab at Chapman University. You can read all about the latest research on the subject and watch some really great videos of hagfish in action. If you’re more into hands-on action, National Geographic offers a Slime Lab kit (affiliate link), which includes information on naturally occurring slime—such as that produced by hagfish—and everything to make your own glow-in-the-dark goo. I just wouldn’t suggest trying to weave with it. Learn something new every day in Handwoven!